Use this resource to guide your annual and post-tenure review processes. All tenured, tenure-track, and non-tenure track faculty are to be reviewed annually. The faculty member provides to the department head or designee the written statement of mutual expectations, annual activity report and plan for professional development, departmental teacher/course evaluations, results of any peer review of teaching and other pertinent information. Post-tenure review – a more comprehensive and cumulative review – takes place for tenured faculty members every five years after being tenured, with some exceptions. Related procedures ensure that post-tenure review is not a re-evaluation of tenure and that it is conducted in a manner that protects academic freedom and the quality of education. 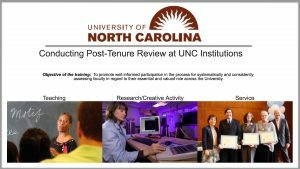 NC State rules and regulations regarding post-tenure review are consistent with the requirements of the University of North Carolina system. We give you the most up-to-date guidelines and policies on annual and post-tenure reviews. Have a question about the annual review or post-tenure review process? We’ve compiled the answers you need. We have created a helpful 10-minute training video for all post-tenure review evaluators. Watching this video in REPORTER will meet the UNC System requirement for post-tenure review training. We have gathered some sample memo templates for your optional download and use. These training modules focus on the essential elements of useful and thoughtful reviews including how to prepare, conduct and manage a meaningful review process; and how to provide constructive criticism in a positive manner. To complete the training, click the link below and then select the Academics tab > Post-Tenure Review Training. Under Option #1 – UNC Community, select NC State University and then click Submit to sign in. You will also need to complete a Training Attestation Form upon completion of the training. Check with your Department Head to determine where these are maintained by your unit.